These ornaments are quick and easy to do, don't let the sculpting process scare you off. Using a wood piece as the armature for the sculpting process you have given yourself the freedom to create quickly and easily. Once you become familiar with Kwik Wood it is easy to use and allows you the ability to add incredible detail to wood ornaments making a unique project. I found these to be fun to make and loved painting all of the additional detail. If you have used polymer clay you will be comfortable working with Kwik Wood. Worried that you do not have sculpting tools, in this series of patterns I have given you household alternatives to use instead. 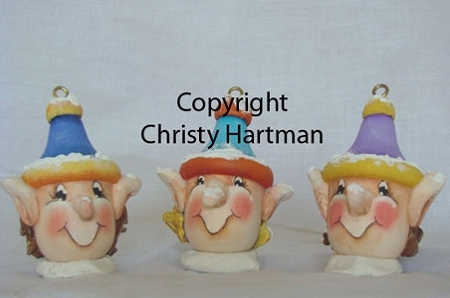 This project showcases three elves as Santa's Helpers Ornaments. Try these out and give yourself the freedom to create. This pattern includes 3 pattern photos and the template and full instructions to sculpt each ornament.